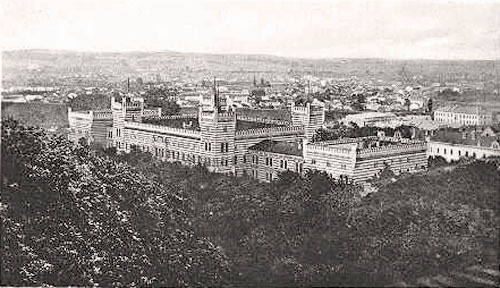 The University buildingwas built in the middle of 19th century by the order of the Austro - Hungarian Emperor Franz - Joseph with the assistance of his Adjutant General - Count Gruner. 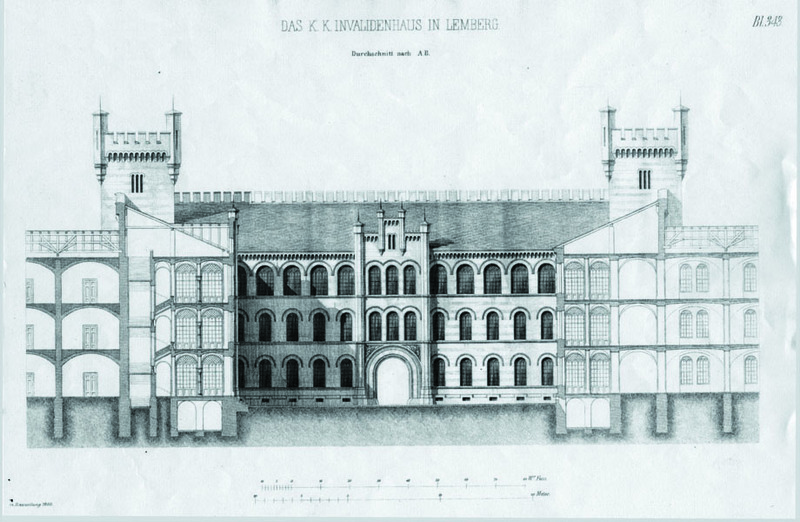 On February 28, 1851 while Franz - Joseph visited Lviv, the representatives of the city requested him to build a special house for disabled militarians from Galicia and to produce them a decent life in their own land. 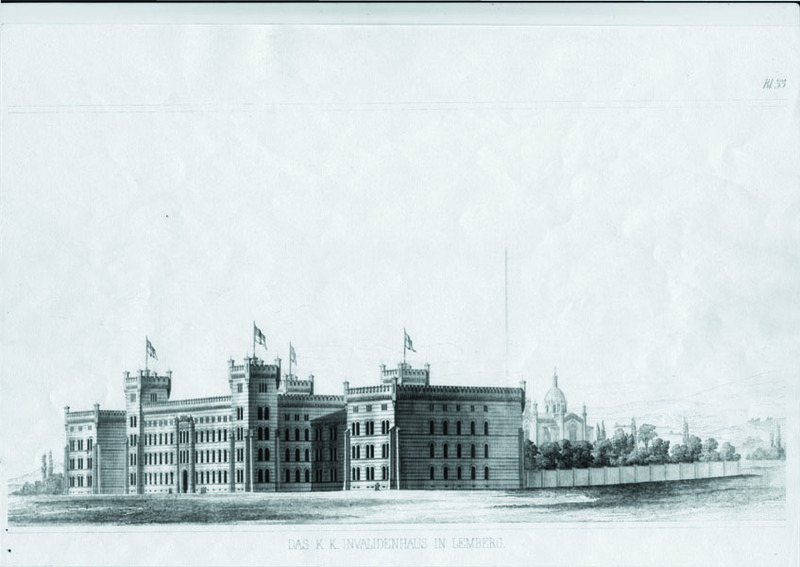 The emperor granted the request and ordered famous architect Theophilus Hansen to make the project. He also granted Zł 700, 000. 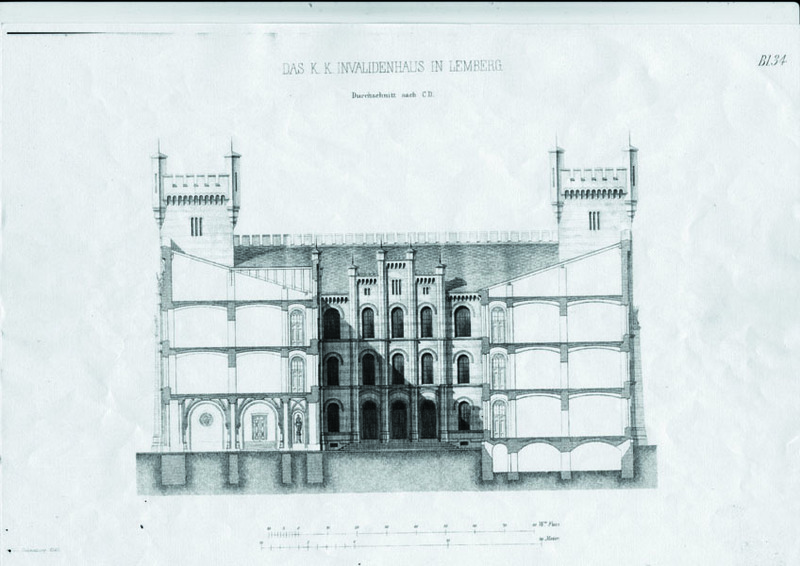 For the construction of the monumental complex with a chapel the city authorities (due to proposal from Karol Hoepflinhen-Berhendorf – the mayor of the city) chose a plot of land on the Pilihovskyi manor (now Kleparivska Street, 35). А special meeting was convened and referred urban area together with an oak forest was donated. Also a municipal brickyard was given for free using. A building was designed by Theophil Hansen in arcade-style (Rundbogenstil) with facades erected from the usual brick (divided in yellow and red stripes). The work was started in 1855 and finished in 1863. It was performed under the leadership of Edward Kaller. The building consists of imposing central part with corner towers and symmetrical side wings. It is decorated with art sculptures and bas-reliefs. Young sculptor Cyprian Hodepskyy and sculptor Abel Per'yer were invited to perform these works. On the facade of the building on both sides of the Austrian coat-armour there are two magnificent sculptures - the warrior who pulls the sword from its sheath and the figure of a woman in a laurel wreath with a palm branch in her left hand and with scrolls of paper in the right hand. near Foot of the sculpture are decorated with palette and brush - the symbols of science and art. These figures are two meters tall and are made of dense sandstone. On the opposite gates (inside and outside the building), four bas-reliefs are made. The figures of women symbolize the victory. The facade of the building is decorated with 26 sculptural elements and 8 bas-reliefs that have survived to nowadays. Many of the sculptural elements were lost (e.g. four statues of the most famous Austrian Field Marshals and generals - Archduke Orel, Count Radetzky, Count Prince Schwarzenberg and Count Shpick. The hall with frescoes also was not preserved. Monumental idea Invalides belongs to the finest examples of Viennese borrowing in the architectural history of the city. Dedication nursing home took place with great solemnity October 4, 1863 in the name day Caesar. Commissioner bishop to conduct this religious act was Mr. feldsuperior (high rank representatives of the Church in the army) P.Bradovski. At 8 am, the canons of the Catholic Church was consecrated chapel, and then the building itself. 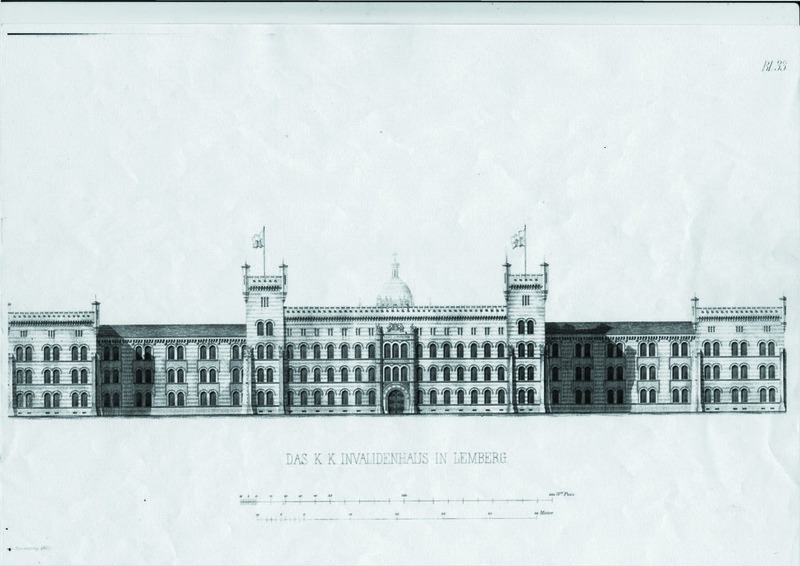 The three-story building was designed to house and retain the hostel hundred disabled. The central part of the structure - for officers, both wings - for junior officers and soldiers. 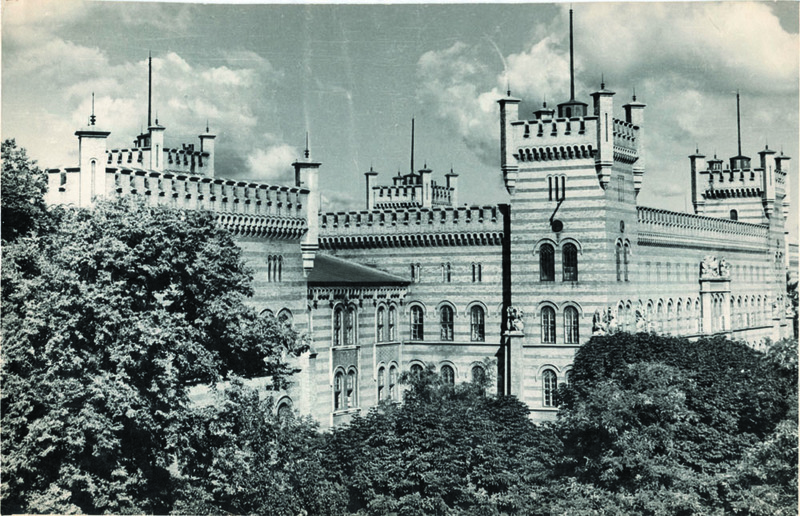 The four towers in the central part of the building housed apartments commandant-general, and here was his office. One wing of the house was adapted to the military hospital, a branch of the garrison. In 1939-1941 western and eastern regions of Ukraine were reunificated. At that time Regiment #233 subordinated to People's Commissariat for Internal Affairs (NKVD) was quartered in the building (military unit #7480). The building was not damaged during World War II so on August 10, 1944 military unit #7480 was quartered there again. 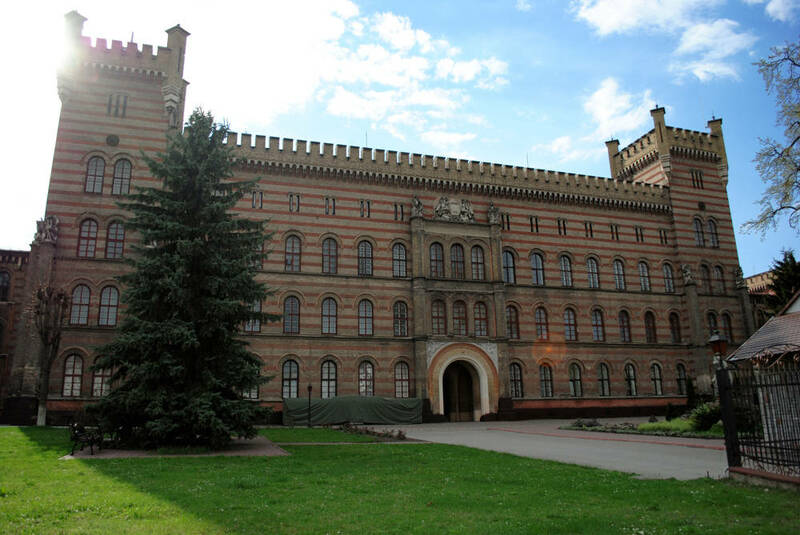 By the decision of the Ministry of Internal Affairs (May 1954) Kiev Fire-Technical School was redeployed to Lviv and placed in the building. 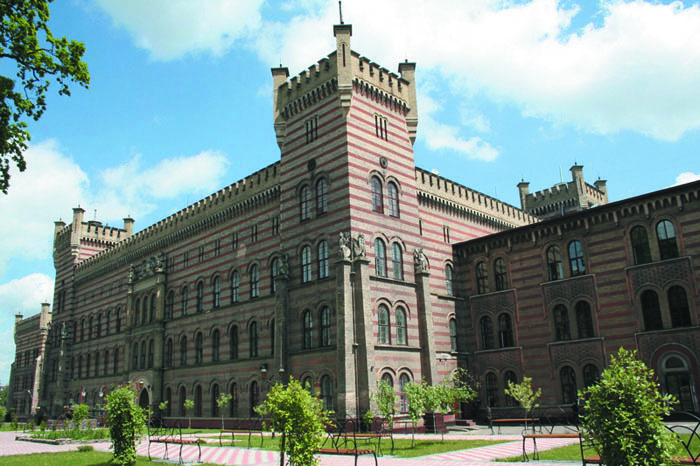 Later it was renamed as Lviv Fire-technical School of MIA of USSR.